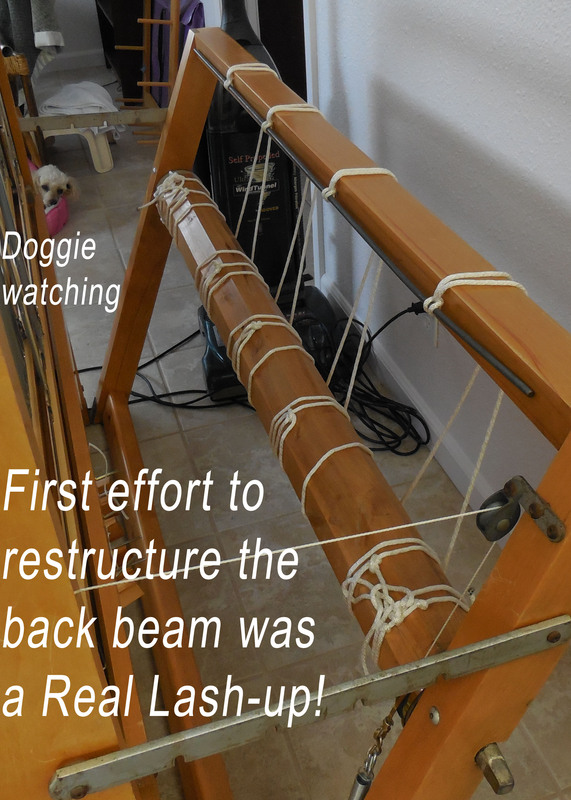 Before we try out the trapeze, I would like to share some history of my old LeClerc Nilus II loom. As you know already, I bought the loom a year and a half ago. It is built of hardwood and very sturdy. Suitable for rug weaving. It was in usable shape, but had a few issues. The two biggest issues were an unreliable brake and an unbalanced warping system. When I set about making repairs and remodeling, I had two things going for me. 1) My sister Ruth who is a master weaver has done this type of thing before and was willing to assist long distance over Skype. We used her iPad and my little laptop. I got up close to the loom where the problem was and we worked out ways to solve it. And, 2) My son John builds houses, always has tools handy, and is willing to run with my idea and make it even better. I began with the brake. Although the loom had the brake band and spring, it needed the lever system that made the brake work properly. It didn’t take long to find a supplier of parts for this loom. Camilla Valley Farms in Canada has pretty much any part for any LeClerc loom model. ( http://www.camillavalleyfarm.com/ ) John helped to install the lever system, then later I made adjustments to make it work even better. The brake lever was screwed to the castle (loom frame). The screw kept working its way out which made the handle wobbly and eventually would have made it fall off. Recently, John drilled a hole clear through the wood to allow the lever to be bolted to the castle. Washers were installed to allow the lever to move as it should. Now, the brake works better than ever before. 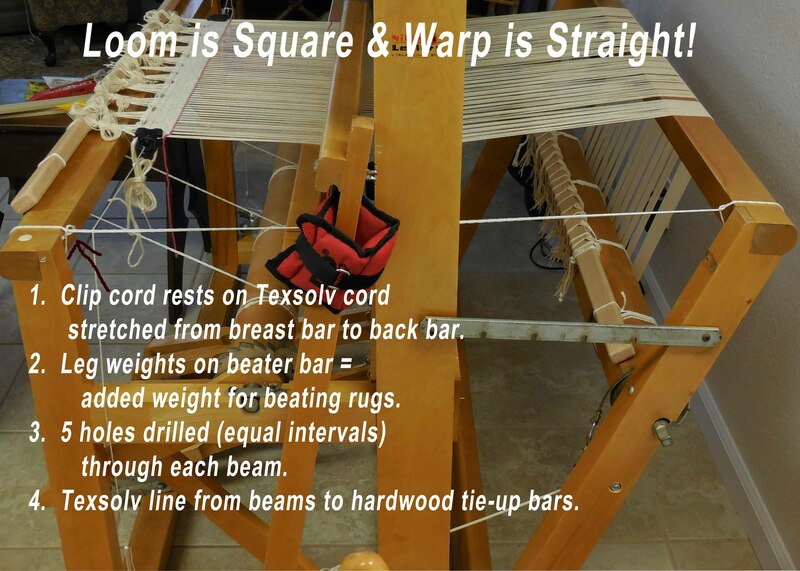 A correctly and firmly tied warp is the single most important part of the weaving process. With a poor warp, you get poorly woven fabric. This is unacceptable. Who would want to weave if a fine fabric couldn’t be achieved? 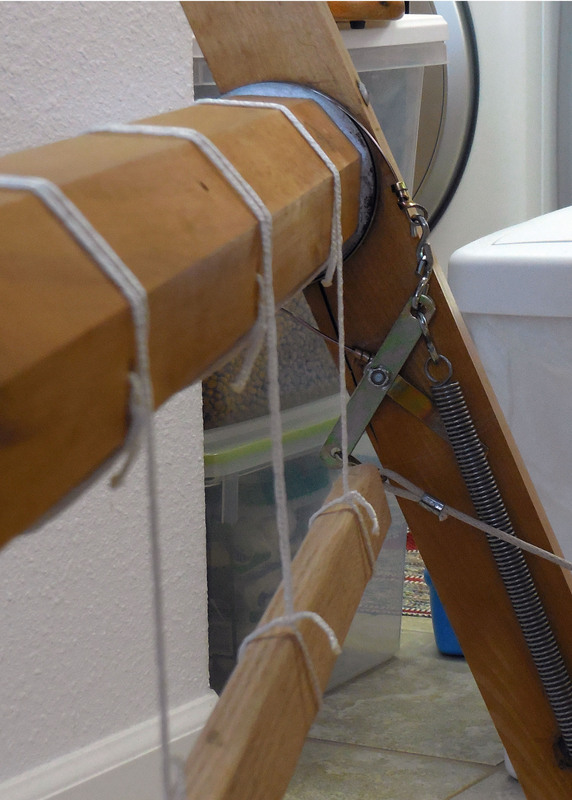 The Texsolv strung between the two bars adds strength to the already strong loom and serves as a place from which the 1 pound of weights attached to the clips hang. This is what keeps the fabric straight. Text explaining the clips follows. The iron bar that held the warp would bend under the strain of a tightly tied warp, making it tight in the center and looser on the edges. You may well imagine this as the nightmare it was. My first effort to make a stable system was the messy lash-up to your left. It worked better than the one on the loom when I got it, but remained unacceptable. Soooo, back to the drawing board. Take another look at the brake picture. Can you see a difference on the back beam? I studied the system on Ruth’s Glimakra loom. Each beam has 5 holes drilled all the way through. Although she was uncomfortable with my drilling holes in my beams, I consulted with John. Would holes jeopardize the strength of the beams? “No,” he said. Then, he obligingly drilled the holes. I got out the Texsolv and made equally measured connections to the new hardwood tie-up sticks he made for me. Those babies won’t bend or warp! Clips attach to fabric. 1 pound of weights creates horizontal tension to keep fabric straight. Works great! Okay, you’ve stuck with me through my heroic tales of loom repair. You deserve this little helpful hint. If you have something too lightweight or too narrow for your stretcher bar, here is a trick to use. When she first helped me with learning to weave, Ruth (tool maker and tool-a-holic, who frequently visits hardware stores and finds great uses for all sorts of things) presented me with a couple different sets of truck tarp clips to use in place of a stretcher bar. 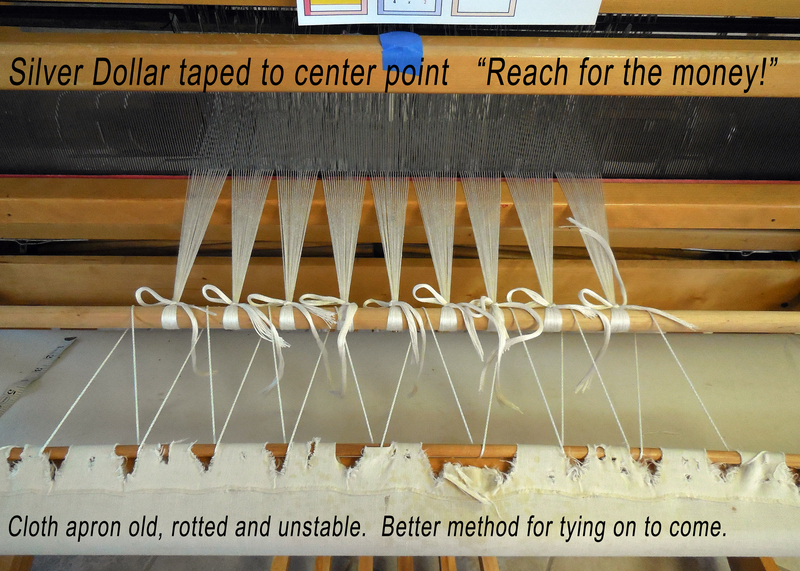 As explained in the picture captions, this handy system helps to produce some marvelous straight selvages (another challenge for weavers, both beginning and advanced). I have to admit, I’ve never tried weaving on such a sophisticated loom. You are incredibly knowledgeable about it all. I’d love to weave rugs – my efforts there are limited to hand-made ones. Mind you, whilst I’m writing, I wouldn’t have the time. I find it all really interesting though. 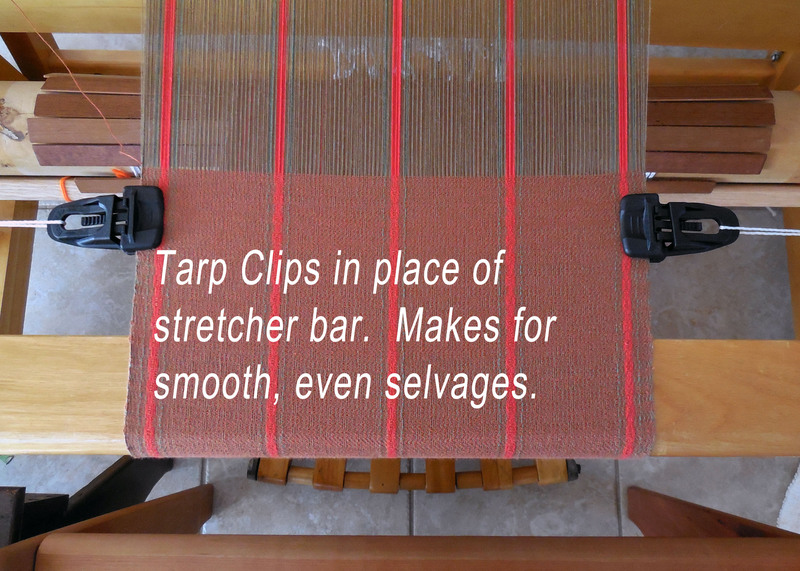 like the tip about the clips for keeping an even selvedge – how could I adapt this for a rigid heddle table loom – if at all? It could be done. The equipment would be: two clips that hold firmly; two sets of weights, each weighing about 1 pound; and some kind of strong string between clip and weight. The objective is to hold the weaving taut while keeping it level. 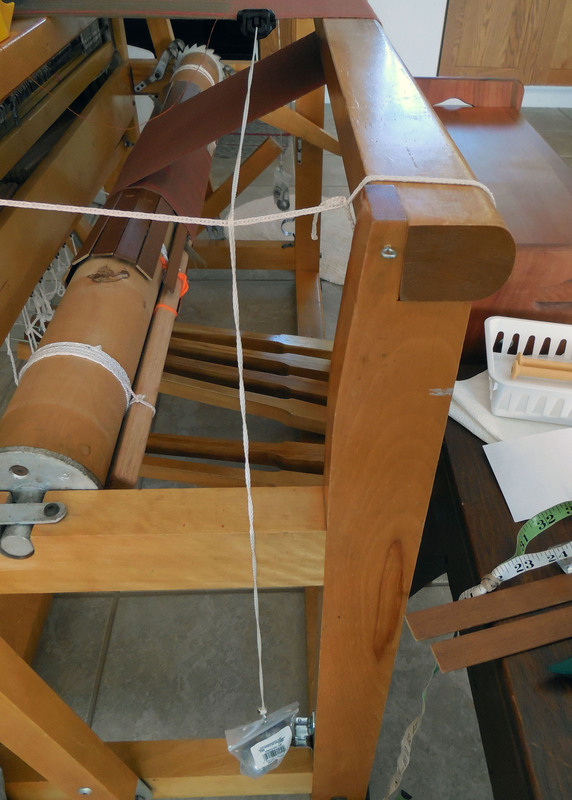 For example, if your loom sits on a table, try draping each string over a stack of books the height of the weaving, one on each side of the loom.